Chlorophyll and hemoglobin are very similar molecules, as far as I understand. The important difference being one using an iron atom and the other a magnesium atom. Do any organisms use both to get energy from both oxygen and solar rays? If not, is there any good explanation of why? And do organisms that use chemosynthesis also use macro molecules similar to chlorophyll and hemoglobin? The spotted salamander is similar to the sea-slug [another of these animals] in that in order to be partially photosynthetic, it maintains a symbiotic relationship with algae cells. While it has long been known that a relationship existed between the salamander and the algae, it was presumed to be a relationship in which both organisms worked separately. However, when researcher Ryan Kerney was studying a batch of spotted salamander embryos, he found a bright green color coming from inside their cells. The chloroplasts were found near the mitochondria within the salamander’s cells, meaning that the mitochondria were likely directly consuming the oxygen and carbohydrates that are created through photosynthesis*. The most amazing part about this relationship is that all vertebrates have strong immune systems that tend to destroy any foreign material found within their cells. Although the reason for this is unknown, this makes the spotted salamander the first vertebrates to be discovered to have the ability to photosynthesize. Eggs of A. maculatum can have a symbiotic relationship with a green alga, Oophila amblystomatis. Jelly coating prevents the eggs from drying out, but it inhibits oxygen diffusion (required for embryo development). The Oophila alga photosynthesizes and produces oxygen in the jelly. The developing salamander thus metabolizes the oxygen, producing carbon dioxide (which then the alga consumes). Photosynthetic algae are present within the somatic and possibly the germ cells of the salamander. It should be noted that this animal is not able to directly perform photosynthesis, but it's still able to get energy from the sun and, being a vertebrate (and not a fish from the family Channichthyidae), it has hemoglobin. I'm not sure whether I understand the question correctly; because all plants use respiration! Some of the organic high-energy substances produced by photosynthesis are later "burnt" to produce energy in the same "respiration" process used by animals, producing CO2. The difference to animals is that green plants synthesize their carbs (including the ones they burn for energy), fat and proteins from thin air, so to speak, while animals must eat them. 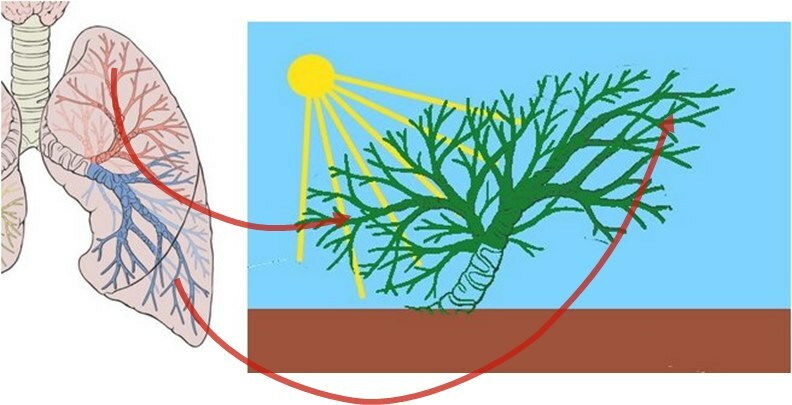 These antithetic processes, photosynthesis and respiration, are often tied to the day-night cycle. When light is available, the plants-only photosynthesis dominates so that the plant consumes CO2 and emits oxygen; at night, when photosynthesis becomes impossible, the usual common-place respiration causes the plant to consume oxygen and emit CO2, just like animals. So how do plants breathe — or rather, exchange gases with the atmosphere in general — if they don't have lungs or gills? The key is the large surface area of typical plants with leaves. Seen in this light, a tree looks well-designed for filtering stuff out of the atmosphere. Consider these two images. The first one is a lobe of a human lung3. The second one is a tree... or is it? A plant's living cells, including the ones in the stem, are never far from the surface. Photosynthesis happens mostly in the thin leaves. Because of these factors — smaller amounts of gases per time over shorter distances — plants do not need high-volume, long-distance gas transport in the fashion most large animals do, with blood circulation. The gas travels between and through the cells as needed, guided and regulated by mechanisms detailed in Kimball's text. The fluid traveling through the stem provides (lots of) water to the leaves in the upward direction and nutrients to the living cells downward, but apparently does not carry (much) gas. Your question seems to be triggered by a perceived similarity between the molecule giving blood its red color, hemoglobin, and the molecule which gives plants their green color, chlorophyll. True, both are organic molecules with metal atoms embedded, but they are quite different, even apart from their color. Hemoglobin is a protein with a fairly complex spatial structure; look at the image on the Wikipedia page. It weighs as much as 64,000 hydrogen atoms, i.e. it has a molar mass of about 64,000 g/mole. Chlorophyll is also an organic molecule, i.e. it has carbon chains and rings, but it is not a protein. (In living cells Chlorophyll molecules are embedded in a protein complex, arranging them to work together; that is a different thing.) It does not fold in space, partly because it is not as big. Its molar mass is only close to 900 g/mole, almost 80 times lighter than hemoglobin. A model of one variety can be found on its Wikipedia page, too. The jobs the two molecules do also are fairly different, even though both have to do with oxygen. Hemoglobin has a transport job. It binds oxygen efficiently. The spongy, blood-heavy lung tissue absorbs oxygen, which dissolves in the blood and is bound to the hemoglobin swimming around in it. There is a lot of hemoglobin in our blood, increasing the blood's capacity for oxygen transport by a factor of 70 compared to just dissolving oxygen in water (and it dissolves actually quite well in water!). Thus, hemoglobin does not synthesize anything but simply transports gases, mainly oxygen, through the body to where they are needed. Some athletes dope by collecting their own hemoglobin and re-injecting it before a competition, thus increasing oxygen supply for their muscles. Chlorophyll does not transport molecules but instead does some heavy chemical lifting. It absorbs light to harvest its energy through the mechanism called photosynthesis. The details are fairly complicated, but the big picture is not: It is a reversal of respiration, or chemically a reversal of oxidation, called reduction: Oxygen is separated from the hydrogen in H2O and carbon in CO2 and given off to the air. Doing this consumes the same amount of energy which is released during oxidation (be it by fire or by metabolization in the plant). The emerging oxygen-poor(er) compounds can be oxidized later elsewhere to release that energy, or can be used as building blocks for new cells. 1 My girlfriend thinks I'm stupid not to know that ;-). 2 Unless it is buried and taken out of the biosphere, fossilizing to peat and eventually coal, tar and mineral oil. Then the net CO2 balance of a plant's life is indeed negative, i.e. the plant has removed CO2 from the atmosphere; until somebody excavates the fossil fuels, re-injects them into the biosphere and and restores former CO2 levels and all the tropical climate which made the old jungles grow so well. 3 From wikipedia, https://upload.wikimedia.org/wikipedia/commons/a/a1/Lungs_diagram_detailed.svg. By Patrick J. Lynch, medical illustrator, via Wikimedia Commons. The "tree" is actually the same lobe, rotated and colored. Indeed several organisms can do both. Another good example following the answer from Prince of an organism that can do both photosynthesis and respiration would be cyanobacteria. Not the answer you're looking for? Browse other questions tagged photosynthesis respiration energy or ask your own question.